PJ bottoms in our race kits! 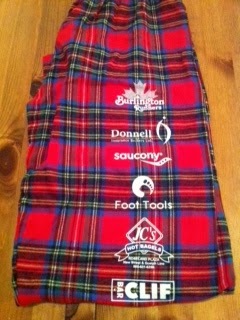 In Ontario, the first major race of the year is the Robbie Burns 8K in Burlington, Ontario. Now in its 35th year, it is well-organized and a favorite for many – even with a high likelihood of cold temperatures. I have raced it several times in the past few years and really enjoy it for the competition. Let’s face it; a January race is going to bring out the toughest runners and result in some fast times. Last year, I didn’t run the course well, only to realize a few days later that I had been developing a cold which eventually led to bronchitis. That slower time had become a monkey on my back and I simply had to go back to Burlington to wrap up some loose ends. I wanted to find that sub-35 that I couldn’t catch – and I’ve been wanting that for the past year. 1. Better last year’s time. 2. Run a sub-35. If I accomplished this, I would have also met my first goal. 3. Walk away with an Age Group Award. As stated above, the competition here is tough and any AG prize is something to be extra proud of. I felt these goals were achievable if things went according to plan. However, as we got closer and closer to race day, it became apparent that Mother Nature had a mind of her own and this race was about to become a test. next post: Race Report, Robbie Burns 8K.